Over the last four decades there has been a growing consensus that tall buildings must consider the use of specially designed and constructed evacuation lifts as part of the overall egress strategy of a building. It has been widely acknowledged that the use of an evacuation elevator / passenger lift will speed up fire evacuation and will provide a critical component of an accessible means of egress for those occupants with disability. However, when an evacuation lift is provided, there needs to be suitable signage displayed in prominent locations so that building occupants know of its availability. There is no point designing and installing an evacuation elevator but neglecting to provide suitable signs. This would be unsafe and defeat the purposes of the extra level of evacuation safety provided by the evacuation elevator. Furthermore, people are conditioned not to use an elevator during an emergency. “Do not Use Elevator in Emergency” signs (or similar wording) are displayed in most buildings. So if the lift is to be used for evacuation purposes, then people need to know. A consistent approach using the Accessible Means of Egress Icon can help to provide a consistent, clear and informative message to building occupants. There must also be accessible formats of signs installed at an accessible height range for all people, with Braille and tactile information. 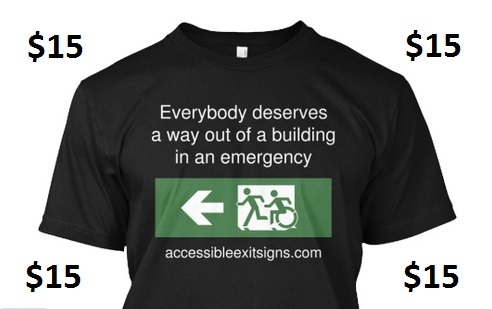 This design also has a tactile version of the Accessible Means of Egress Icon.